Christmas is coming soon! 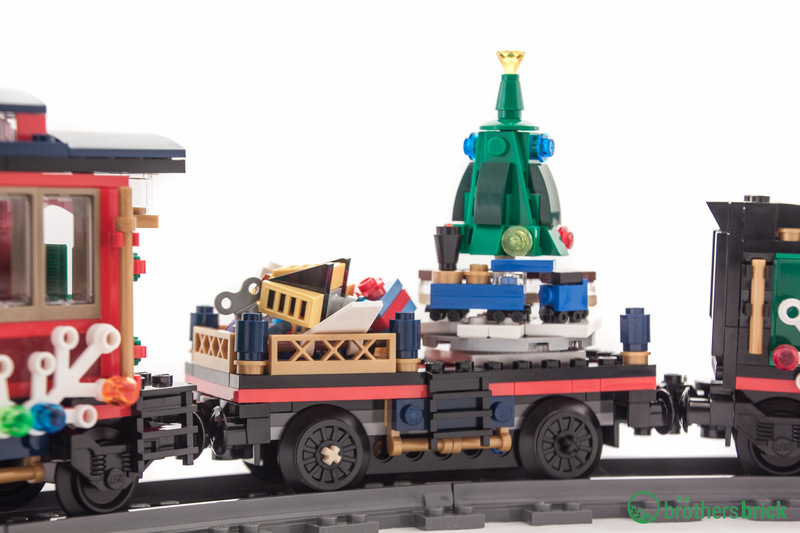 It’s time to set up your decorations, and if you’re like me, that includes your LEGO Holiday Village. 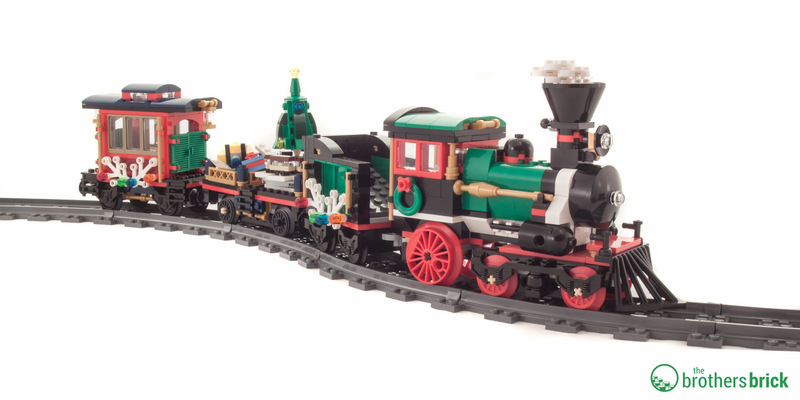 This year, LEGO sent us a copy of 10254 Winter Holiday Train, available now. 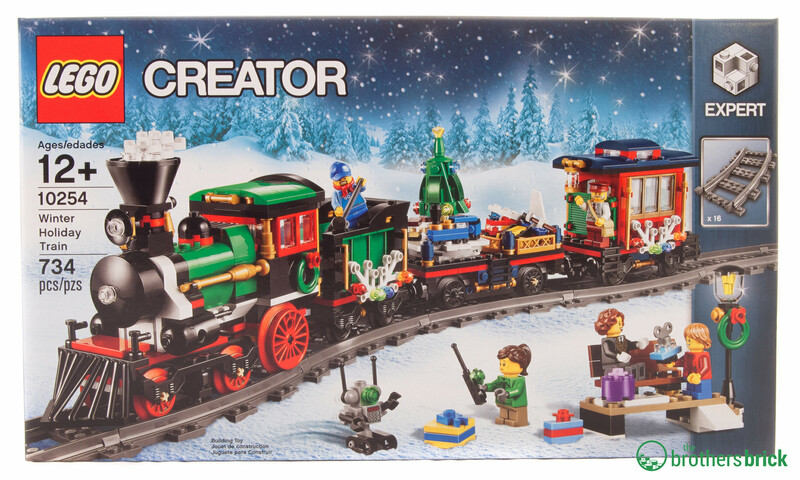 This great addition to your Holiday Village retails for $99.99 USD, and has 734 pieces. The Winter Holiday Train certainly hits nostalgia, of those ceramic holiday villages and Christmases of years past. The 2016 Holiday Train has a color scheme similiar to the original 2006 version with some updates to accommodate new parts, which help give it wonderful details throughout the build. 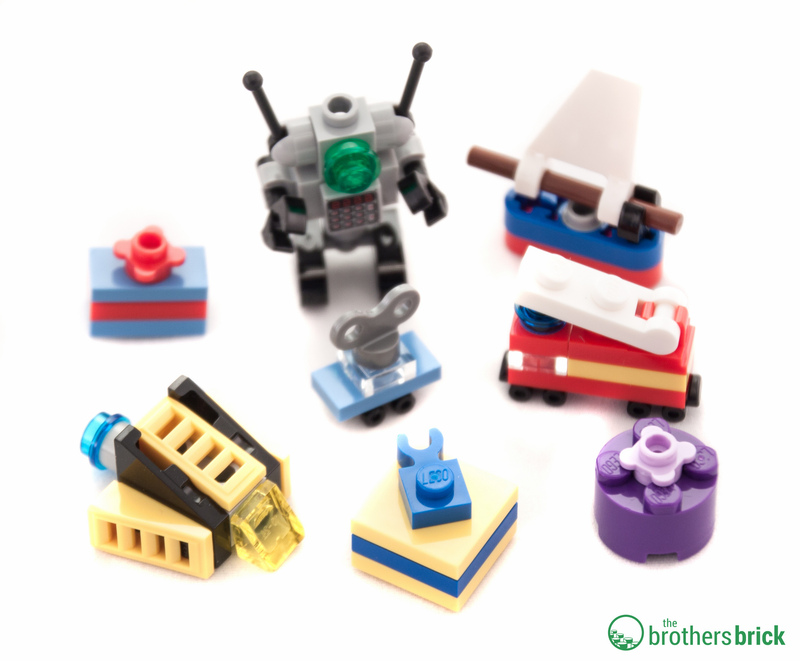 The set comes with an engine, tender, cargo car, and caboose along with 5 minifigs and a plethora of toys clever microscale toys. 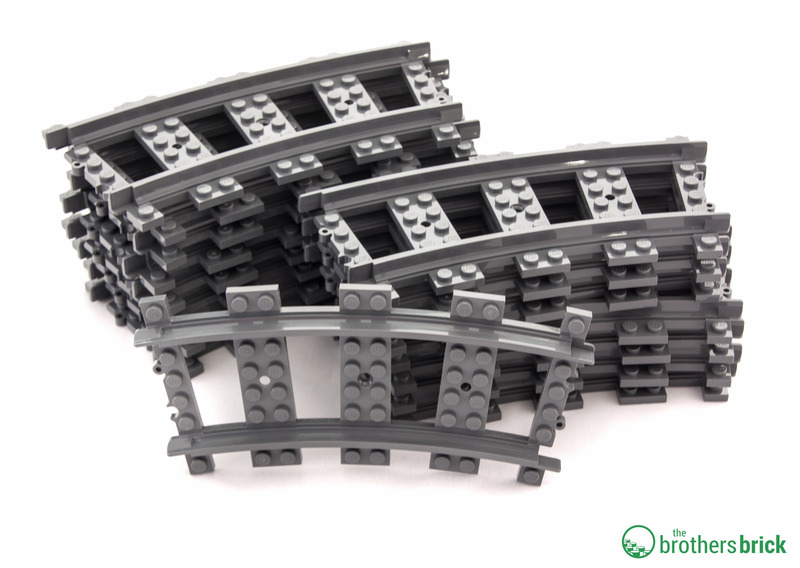 Additionally, it comes with 16 sections of curved track. The box contains bags numbered 1-3, with a very small half-sheet instruction book and a full size instruction book. 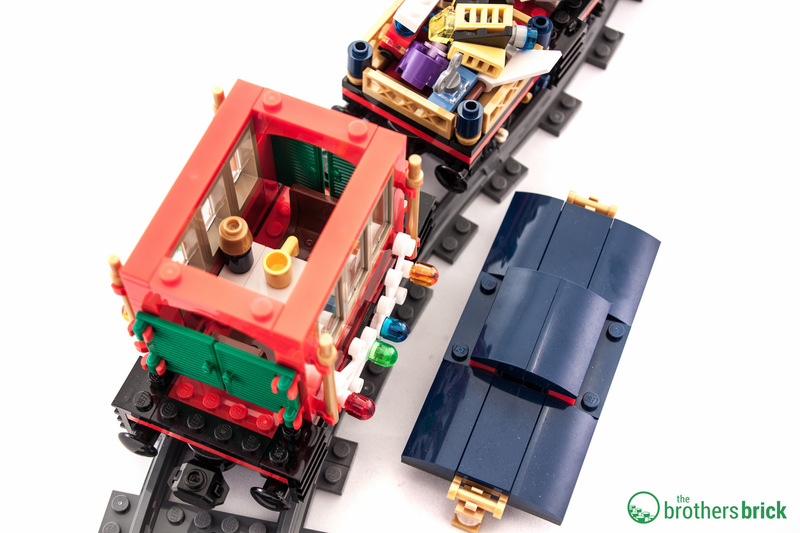 The first set of bags contains the minifigs and toys, while bag sets 2-3 build the train itself. The train just looks lovely. The little details on the engine give it a classic feel and it’s quite smooth. There are very few hard angles to it. The pearl gold highlights work very well with the green. This is the second set to feature small white plant leaves (the first being 41068 LEGO Frozen Arendelle Castle Celebration). I look forward to these being more widely available; we’ve been waiting quite some time for the smaller white leaf to be released! The engine is a great design of classic steam engine design and the bright red wheels. The set uses green life-preservers for the wreaths, which has been showing up more and more. It’s a great use of the part and a better minifig-scale wreath. The gold highlights do a nice job on making the train seem quite fancy and stylized. The tender uses 1x2x3 green panels to simulate a corrugated side, giving some texture. The trans-colored light covers instead of 1×1 trans-color plates has been showing up in the Holiday sets for a couple years now, which happens to work better as lights and are quite useful. I absolutely love the next car in line — it has a Christmas tree that spins! With the help of gears underneath, the tree spins making the fantastic micro train at its base go around in a circle. The car has a little area for some of the micro-built presents as well. The tree could have been designed a bit better; the use of the dark-green baby bows seems out of place with the rest of the bright green. The tree uses 1×1 round plates, which is inconsistent with the rest of the lights used on the train. The tree still works as a tree; I just wish it had been a bit more consistent with the rest of the design choices on the train. 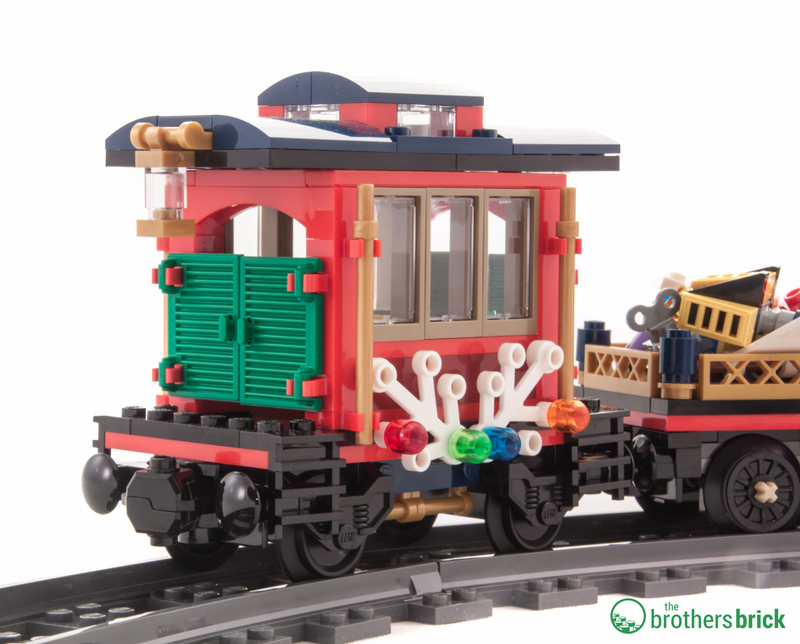 The caboose is bright red, with old-west style green doors that sing open with gold lanterns. It’s a tad cramped; it’s supposed to fit two minifigs but it’s a tight fit for sure. While I realize the choice to leave the ends of the caboose open like that was deliberate, it seems unfinished without some other sort of detail. It’s a small thing that does not detract from the aesthetic of the train, and can be easily fixed up with parts from your own collection if it’s something you notice, too. I’ve always had a soft spot for winter trains. 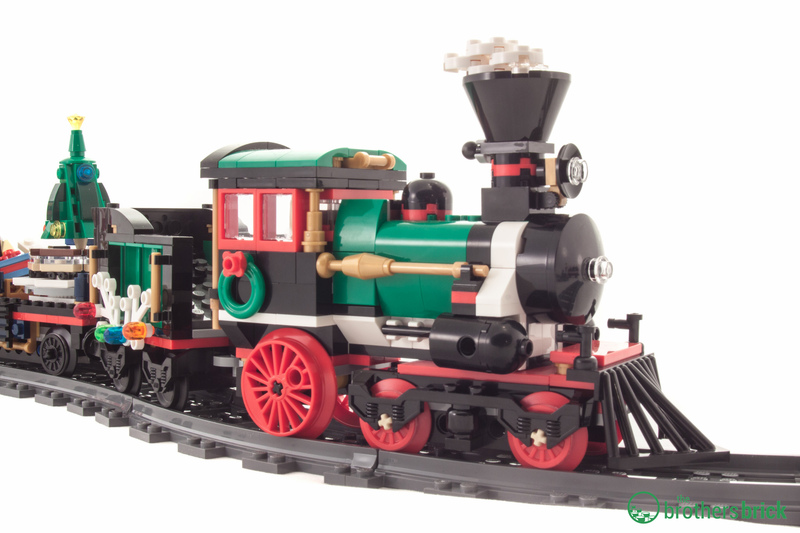 My very first proper LEGO train was 10173 Holiday Train back in 2006. I vividly remember going to the LEGO store so I could order it with the 9-volt accessory pack, and was absolutely delighted when my box arrived. I built my train, and set it up on the kitchen table. My dad played with it more than I did. I think he might have been a bit sad when I finally got my train back last year. There were some things that differ from the 2006 train that I would have loved to have seen in this one. To compare, the 2006 version has 965 pieces, and retailed for $89.99. It did not come with track; it was nearly twice as long as the 2016 version. The 2006 version had an engine, tender, and caboose; it also came with a cargo car full of toys, a passenger car, and a half-sized car with trees. In contrast, the 2016 version is $99.99, 734 pieces, comes with track, and is four cars in length, and more toys than fit in the space provided on the car with the tree. I recommend picking up the 10254 Winter Holiday Train. It is a good, solid set and a great addition to your collection, whether it’s going to remain on display in a Holiday Village or be incorporated into a collection. It’s a nice update, with better design, and different benefits for 2016. The set is available on Amazon, and is currently on back order on The LEGO Shop.